I finished a UFO at Quilt Camp last week. It was the table runner I started as an experiment when I was teaching at the Pine Needle‘s quilt retreat in June. Remember this? It’s a bit difficult to see from the photo but the outer edges of the runner were cut to match the curves inside. 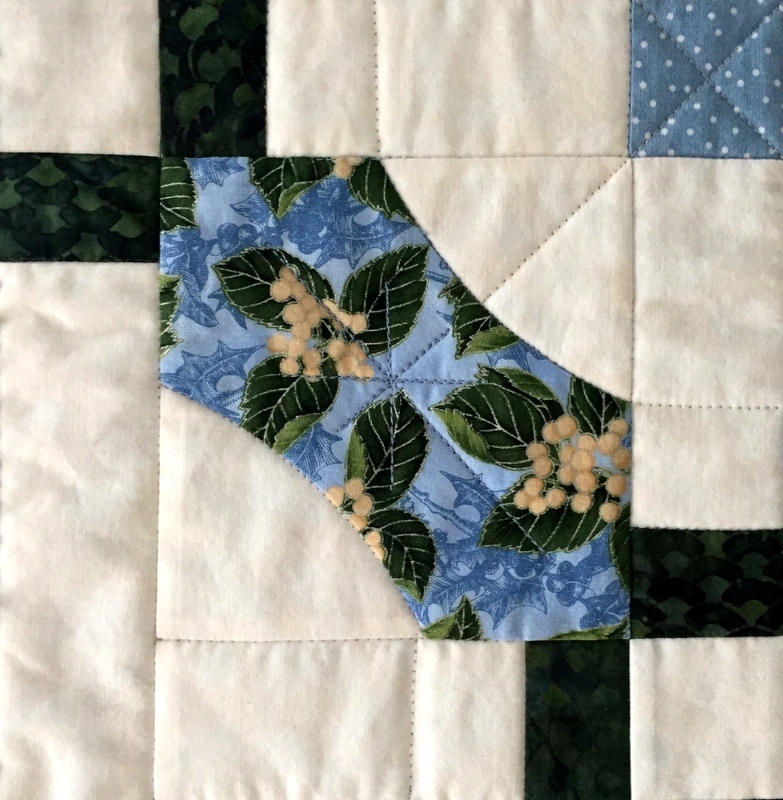 I wanted the binding on the quilt to echo the design, which you may recognize as Mini Mod Tiles, that marvelous free pattern from Sew Kind of Wonderful that has been the subject of several posts over the last few months. I used light blue thread on the back to blend in so the runner is essentially reversible. The label can go in the very center, to be covered by a candle or bowl. I don’t think I would ever have figured that out on my own. Thanks, Heather! The runner measures 13″ x 38½”, a nice size for the center of a table or dresser. I’m giving it to my twin sister in Atlanta this weekend as a birthday/hostess gift; my husband and I are headed there later this week for our annual extended visit over Thanksgiving. I’m very pleased with this variation on the Mini Mod Tiles design. And, having made two quilts (a mini and a supersized version) from the pattern, I am finally ready to put MMT behind me. Just in time, too! The Sew Kind of Wonderful team has come out with some marvelous new patterns. I have no doubt there is another Quick Curve Ruler quilt in my future. Don’t these quilters look happy? This photo was taken the first evening of the Pine Needle Quilt Shop‘s retreat last month in Union, Washington just after completing a pillowcase exchange. The retreat had a western theme, which is why you see cowboy hats, boots, and bandana prints on both people and pillowcases. The retreat was held at St Andrews House, a retreat and conference center run by the Episcopal Church of Western Washington. I had the pleasure of teaching for the Pine Needle at St Andrews House last year and returned this year for two back-to-back retreats. This is the quilt that appears on the SKW website. It was made with the QCR Mini, the smaller of the two specialty curve rulers designed by Sew Kind of Wonderful. The block finishes at 10½” and the entire quilt finishes at 35″. Did you know the pattern is a free download? You can find it here. In no time at all, my students were sewing curves the Sew Kind of Wonderful way: no pinning! The fabrics are cut slightly oversize and trimmed so that when the block components are sewn together, they fit the way they’re supposed to. The blocks in the top row were made by Diane and Lynn. We were all dazzled by Diane’s choice of Kaffe Fassett prints combined with a bold text print for the background. Doesn’t Lynn’s block look like real tile? She chose the perfect batik for her focus fabric to get that effect. Lynn’s sister Karen made the block in the second row. She reversed the usual placement, using a lovely floral print for the background and a dark blue solid where a print would normally go. The new blocks were made by Denise (Asian fabrics in second row), Colleen (aboriginal fabrics in third row), Puff (autumn colors on the far right side of photo), Marti (marbled print with rust background in lower left), Tamara (rich purple batiks in bottom row), and me (blue and green holiday print in third row). As you can see with Puff’s two blocks on the right, one block was made with a contrasting center square and one without. Puff decided she liked the top version better. I told the students, “Once you have your curves sewn and trimmed, I think you’ll be pleasantly surprised how quickly the quilt goes together.” When I came to the classroom on the morning of the second day, I was flabbergasted to see a finished quilt top. Kay had finished hers the evening before! Linda’s background fabric, from the Alison Glass Sun Print 2016 line, goes so well with her wild floral print. She added a border of her yellow accent fabric. See how the edges of the runner have been cut to match the curve? That was an option I suggested to accentuate the curve within the block. Kitty will bind her runner in the focus print which will give her runner nice definition. She’s going to make a set of napkins from the print to go along with the table runner. When I bind this in the dark green, the curved ends will really stand out. My plan was to snap pictures on the last day of all the quilters with their projects but alas, that didn’t happen. Still, I think you have an idea of the many wonderful ways in which Mini Mod Tiles can be interpreted. Sometime this fall the Pine Needle will have a reunion for retreat participants. Many of these projects will be completed by then and I promise to get some good pictures. In my next post you’ll see more versions of Mini Mod Tiles, including some supersized ones, made by the second group of retreat participants. Do come back to see! The curves were cut with a specialty ruler called the QCR Mini — the smaller version of the Quick Curve Ruler from Sew Kind of Wonderful — and sewn with a pins-free technique. SKW has great patterns for sale on its website — and several free patterns, including Mod Mini Tiles. You can find all the free patterns here. The link to Mini Mod Tiles is here. Using the original Quick Curve Ruler I made a “supersized” version of Mini Mod Tiles that I showed you in my last post. The quilt, named Terrazzo Tiles, is at the longarmer being quilted as I write this. Look for a reveal post in just a few days! I’m teaching both sizes of this design at a quilt retreat coming up in a few days. A couple of my students are interested in making a wall hanging or table runner so I decided to play around with possible border treatments. Since a finished block of the original Mini Mod Tiles is 10½” wide, a border is clearly called for. I used a gluestick to add cornerstones in each corner. Hmmm. That’s a little stark for my taste but the effect might be completely different if a lighter fabric were used where the black is used here. I am loving this! I think I’m on to something here. . . Which do you like better, 3 or 4? Whether those border squares stay or go, the curved edges are definitely staying. A three-block runner like my mocked up version would finish at 13½” x 38″. A four-block version would finish at 13½” x 50 and a five-block at 13½” x 62″. I’m eager to try this out with some holiday fabric that’s been in my stash for a few years. My Mini Mod Tiles mania continues!